The Regional and City Planning Study Program (PWK) in Padang City was born because of the demand in the world of work for planning experts for structuring, planning, and providing problem solving solutions for the City and District. The Bung Hatta University educational institution took the opportunity carefully by establishing the PWK study program on January 28, 1994 with the decree of establishment No. 30 / DIKTI / KEP / 1994 ... Under the leadership of Mr. H.Ir. Lesman, as the head of the first department, has been working for five years since his establishment; the PWK study program has been able to graduate as many as 9 students in 2000. Long struggle in improving PWK study programs through registered status stages: 1994 - 2000, Accreditation C: 2000-2005, Accreditation B: 2006-2012 and 2013-2018 with Decree No. BAN-PT 015 / BAN-PT / Ak-X / S1 / VII / 2007 concerning accreditation of PWK majors. Until now there have been many things that have developed in the PWK Department, both in terms of human resources, management of majors and funding, collaboration with outside parties, facilities and infrastructure, as well as in terms of student affairs. Now PWK Univ. Bung Hatta developed from time to time with the increasing number of students and alumni of PWK graduates who devoted themselves to committing to planning better regions and cities. "Becoming a superior and dignified Regional and City Planning study program of Bung Hatta in the Sumatra region in the study of urban and rural development"
• Organizing quality tertiary education to produce Regional and Urban Planning scholars who are dignified by Bung Hatta and able to compete in the labor market by mastering information technology and being able to absorb information and communicate in international languages. • Acting in scientific research and development in the area of ​​Urban and Regional Planning, especially in the Sumatra region and forging cooperation between universities at national and international levels. • Participating in community service in the Regional and City Planning fields in order to participate in helping the community and local government. • Produce graduates who are able to compete in the job market in the field of regional and city planning professions and other fields of work for scholars. • Produce research that contributes to increasing knowledge of regional development in West Sumatra and its surroundings and builds cooperation with other planning schools at national and Asian levels. • Improving the work of lecturer and student community service in the form of providing advice and recommendations for spatial planning starting from the lowest level of government to the provincial level. The PWK Department has 10 permanent lecturers from the PWK department and other permanent lecturers from other departments within the Bung Hatta University. 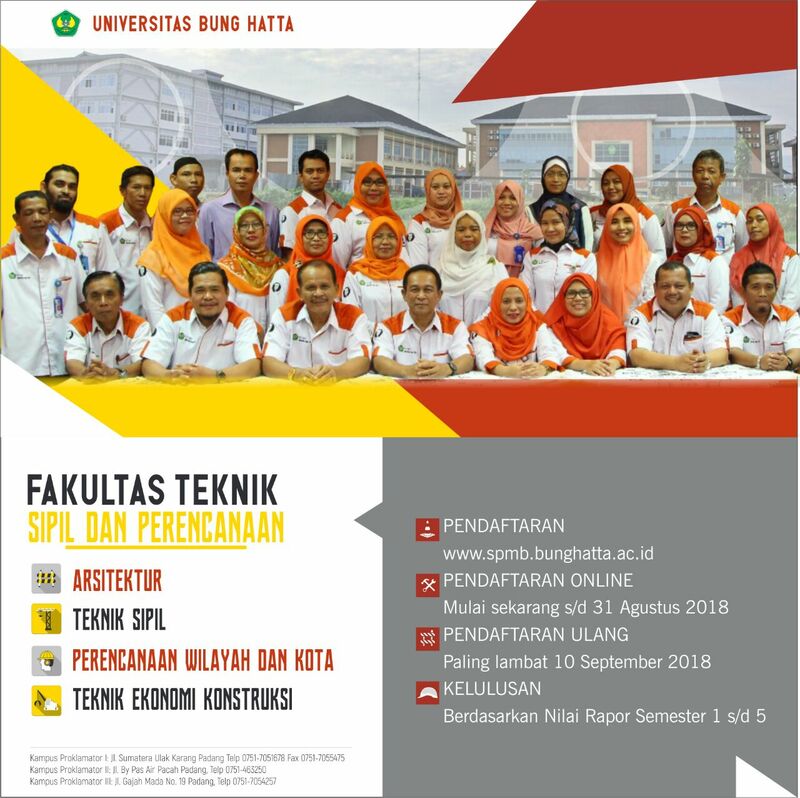 In addition there are outstanding lecturers from other universities such as from Andalas University and Padang State University, or experienced experts who teach mainly in specific subjects. Ir. Sudirman Is, M.T, Ph.D.
Dr. Al Busyra Fuadi S.T, M.Sc. is one of the disciplines that are closely related to the activities of designing buildings and structures (on a micro scale), to cities and regions on the messo and macro scales. is the ideal of the study program to become the best study program especially in the application of values ​​and rules in the world of architecture, especially local wisdom. is characterized by the dominance of man-made structures that will be used as a medium in the application of science. Wisdom, view of life or noble values ​​contained in the wealth of local culture which is one of the strengths and identifiers of the Architecture study program at Bung Hatta University with similar study programs at other universities. In line with the university's aspirations to reach the world class level by 2033 (in accordance with the strategic plan) is the achievement of architectural study programs to be recognized at the Asian level. 8. Facilitating regular communication with alumni, graduate users and universities both at home and abroad for networking. 2. Prepare graduates or graduates who are able to design and master architectural science at the conceptual level. 3. Prepare graduates to enter professional and postgraduate education. The preparation of objectives and strategies for the achievement of the Architecture study program begins with a SWOT analysis to see all the strengths and weaknesses with the aim to provide a strong picture for future development.